Eight artists have been selected to develop innovative artworks for the public realm areas at the new children’s hospital and the two Paediatric Outpatients and Urgent Care Centres at Connolly and Tallaght Hospitals. Following a highly competitive open competition, eight artists have now been selected as part of the Children’s Hospital Group Public Art Programme to develop innovative artworks for the public spaces surrounding the new children’s hospital and the two new paediatric outpatients and urgent care centres at Connolly and Tallaght Hospitals. The Programme is being implemented as part of the new children’s hospital project, a landmark healthcare development for Ireland and the single largest capital investment in healthcare in the history of the State. The project will transform how paediatric services are delivered in Ireland. The successful artists, Roisin DeBuitlear, Jason Bruges Studio, Remco DeFouw, Vera Klute, Rhona Byrne, Ian Wilson, Gareth Kennedy and Martin Healy, will now work with the project Design Team and its stakeholders on developing their artwork proposals. All of the proposals have been conceived with a view to creating a child-friendly environment in the public areas of the new children’s hospital and the two paediatric outpatients and urgent care centres, including the waiting areas, the entrances and concourse areas, the parking areas and the frieze – the base of the garden on the fourth floor of the new children’s hospital, which forms a continuous single storey around the building’s perimeter. During a 12-week research and development process which took place last year, the artists had the opportunity to learn about and respond to the hospital plans. 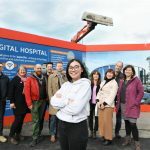 They also gained an insight into the experience of being a child or young person in hospital from members of the Youth Advisory Council* and were inspired by the many gardens and other play areas that will feature in the new hospital. 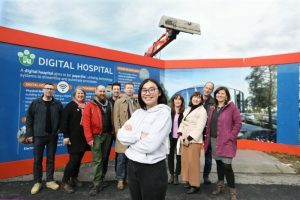 During the four-year construction period of the new children’s hospital, there will be other calls to artists for expressions of interest for other areas of the hospital, including the clinical areas. Art plays an important role in health settings and is proven to improve wellbeing, better clinical outcomes and to reduce stress and anxiety. It helps to provide a high quality and stimulating environment which is welcoming, engaging and supportive to children, young people and their families, visitors and staff. Given the scale of the project, the new children’s hospital and the two paediatric outpatients and urgent care centres represent what is the most significant healthcare-based programme of public art currently underway in Ireland. As well as the commissioning of artwork for these new facilities, the programme will also support the integration of the three Dublin children’s hospitals, Our Lady’s Children’s Hospital, Crumlin, Temple Street Children’s University Hospital and the National Children’s Hospital, at Tallaght Hospital, and planning for the future Arts in Health Programme for when the new children’s hospital opens. The Children’s Hospital Group Public Art Programme will be jointly funded by the Per Cent for Art Scheme and Philanthropy.